You can look at the night sky in plenty of ways — but you might be surprised to learn that using gigantic drums of water is surprisingly effective, creating maps of the sky like this. 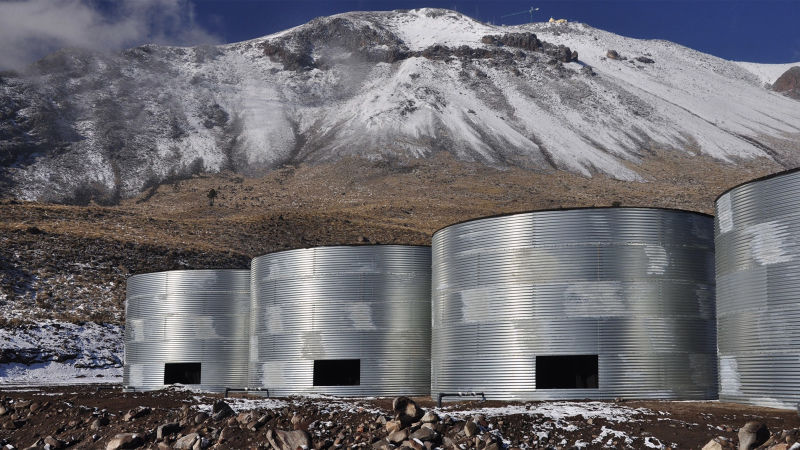 The High Altitude Water Cherenko Gamma-Ray Observatory sits 4115m above sea level on the slopes of Mexico's Volcán Sierra Negra. It's comprised of 300 huge tanks holding 55 million litres of ultra-pure water, as shown in the image below. When high-energy particles from space zip through the water they cause short, sharp flashes of blue light that are known as Cherenkov radiation. By detecting that light, the team can identify what kind of particle was present and where it came from. New Scientist reports that 20,000 high-energy particles are detected by the telescope every single second. They're created when gamma rays hit the atmosphere, generating a burst of particles that spill down upon the surface of our planet. All told, they provide enough information to create the map of the gamma ray sky that you can see at the top of the page. Lurking within the map are some exciting finds: Supernova remnants, pulsars and black holes for starters. Some of the objects have never been seen in gamma ray images before — including one mysterious object that's actually yet to be identified. The map was presented at the American Physical Society meeting in Salt Lake City this week. The High Altitude Water Cherenkov will continue to map the sky over the coming years, identifying objects in the Milky Way and beyond in the process. Better keep the tanks topped up, guys.